1 of 3 Heat oil in a large, lidded nonstick skillet over medium heat. Saute onion for 4 minutes. Add garlic and cook 1 minute. 2 of 3 Stir in brown rice and water chestnuts. Increase heat to medium-high; cook 1 minute. 3 of 3 Push rice mixture to one side of pan and add eggs. Cook, scrambling, 1 minute. 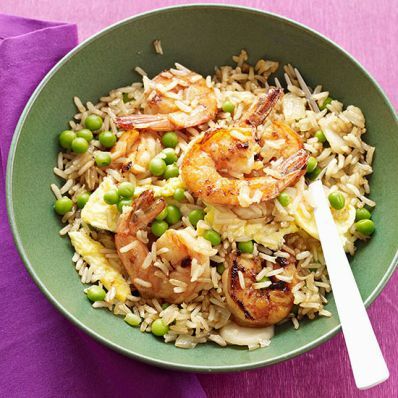 Stir into rice mixture and add shrimp, peas and soy sauce. Cover and cook 6 to 7 minutes, until shrimp are opaque. Remove from heat and let stand 5 minutes. Stir in vinegar and sriracha before serving.